the trees are just starting to change colour. 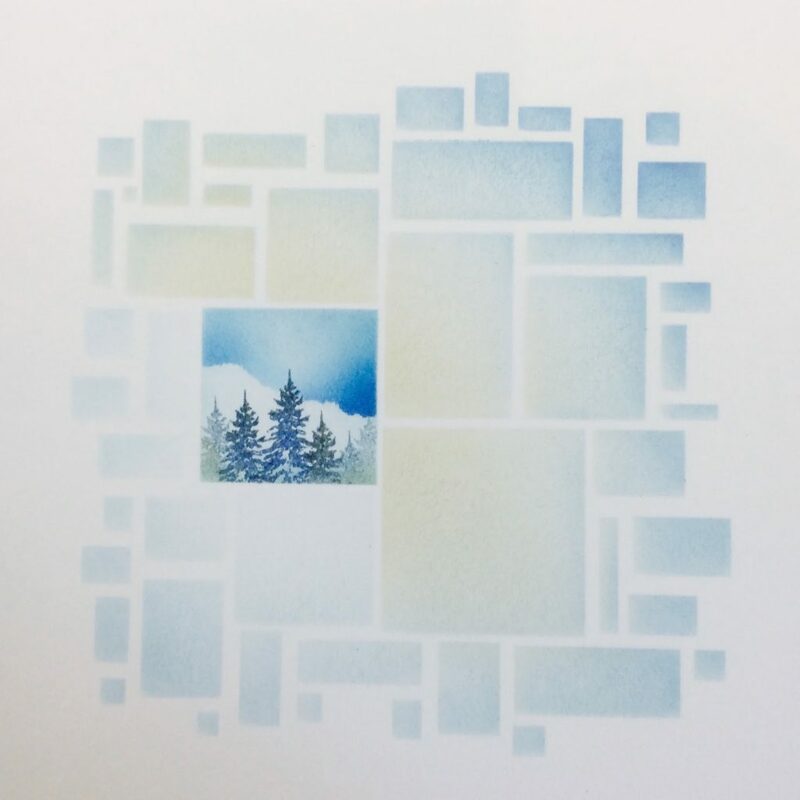 Thought I’d use a stencil and make another little window…. Decided to use some water-colour paper. 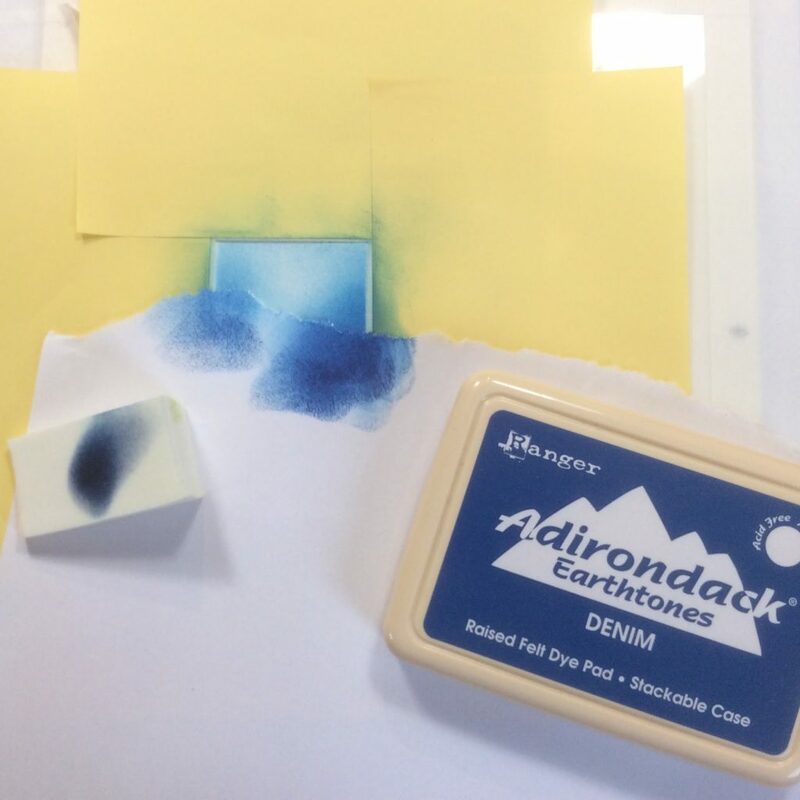 This makes the end result really soft when you work with dye-based inks. 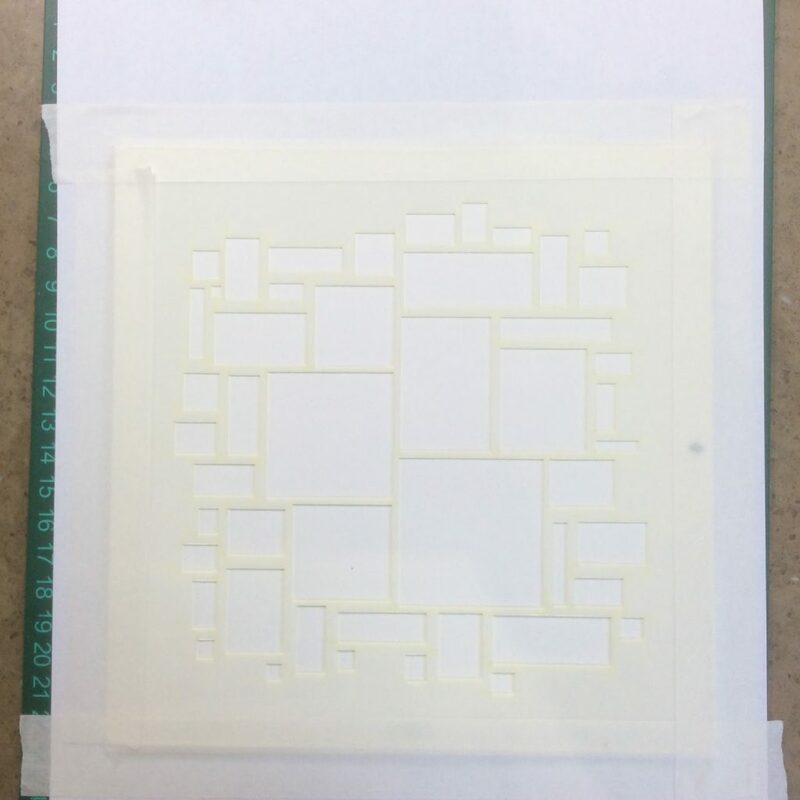 And the Abstract Stencil; loads of windows! and taped it to a piece of copy paper. 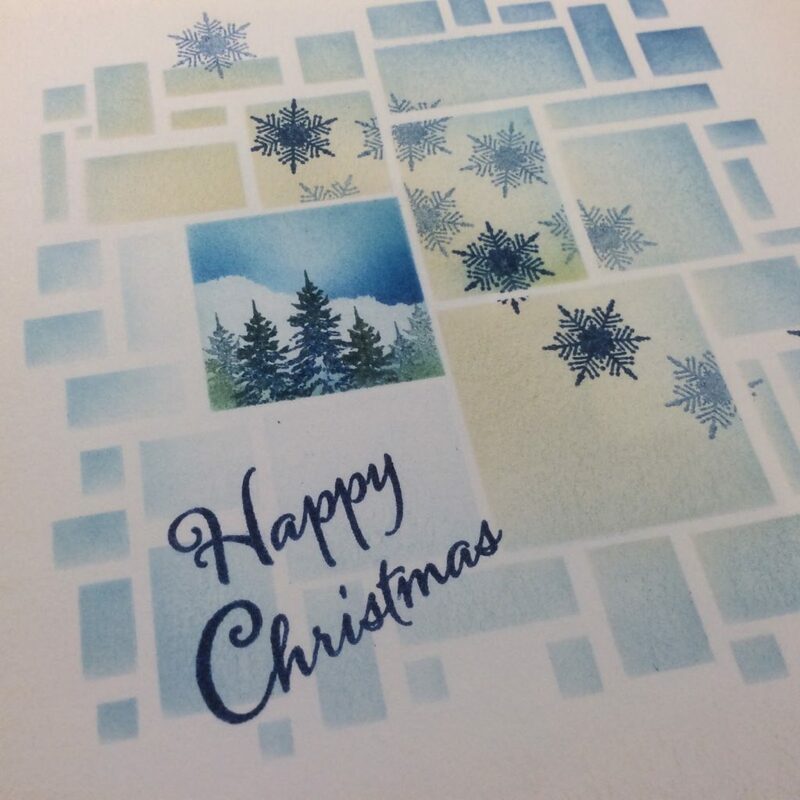 I know, Christmas seems miles away, but if you are going to make your own cards this year, you may want to start thinking about it! 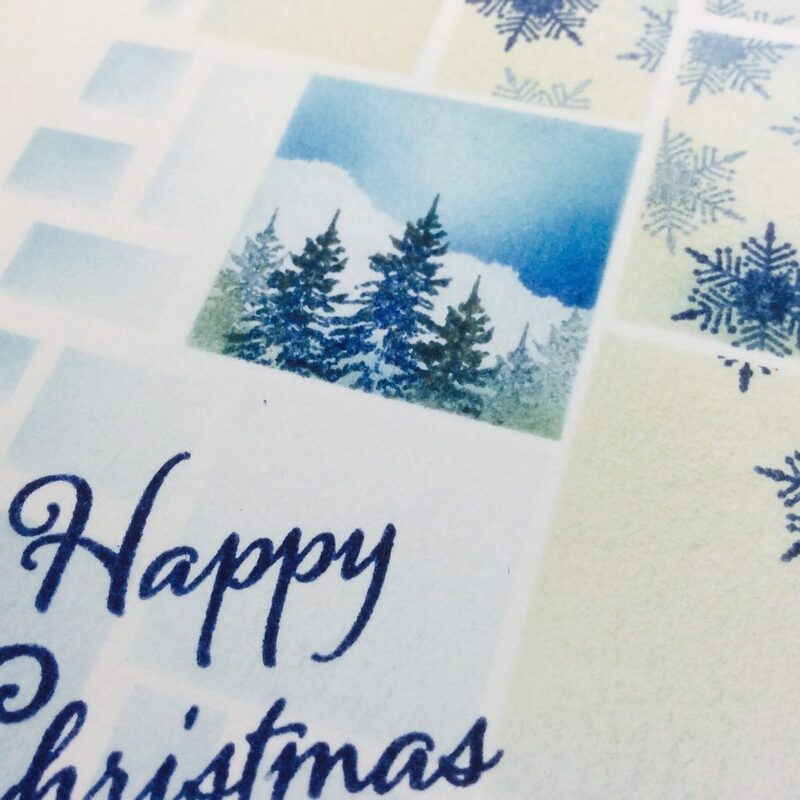 We’ve put a Xmas Stamp sale on the website until Wednesday, which may help you get fired up! Here, I’ve used the little window miniatures. and mask it off with Post-its. and add some night sky with a make-up sponge. with a stencil brush, to define the rest of the windows. 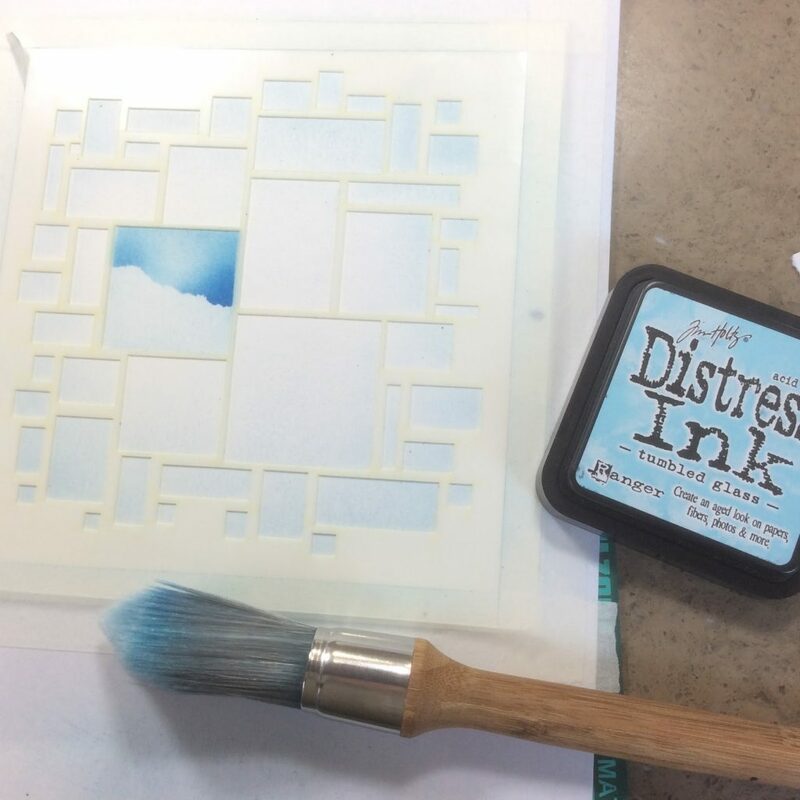 Just brush back and forth across the stencil, concentrating on the outer edges. In fact, when it comes to stamping, I think it’s best to remove the stencil and just work with Post-its. 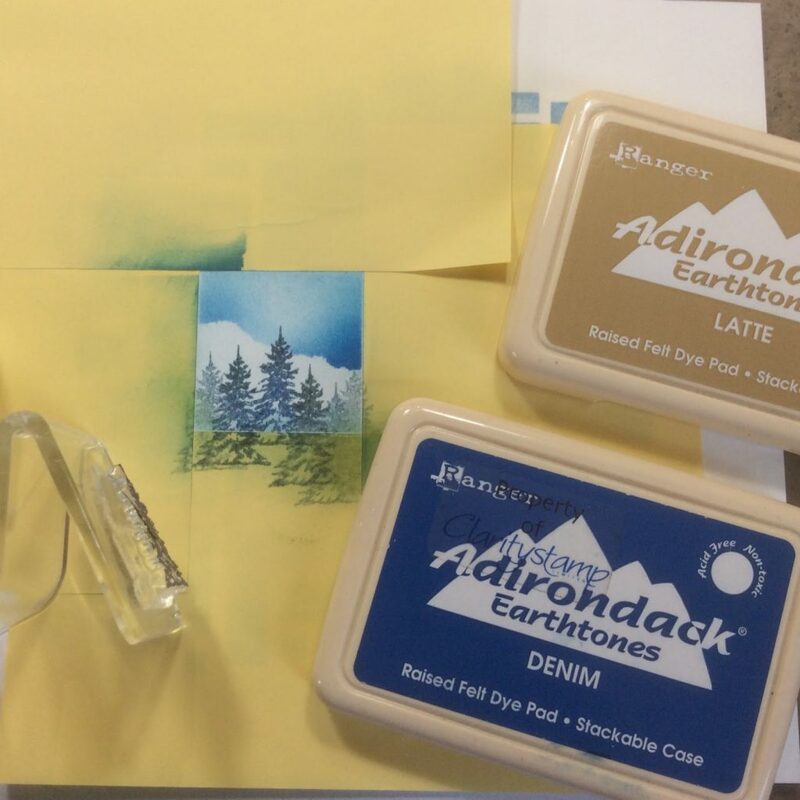 Dab the little tree in the Denim then in the Latte before you stamp. Beautiful blend of colour. Gives you a super greeny blue. nice. Less is more, but I think we need a little bit more here! Cover up the piccy with a Post-It and brush Latte through the centre. Beautiful warm colour on the water-colour paper. 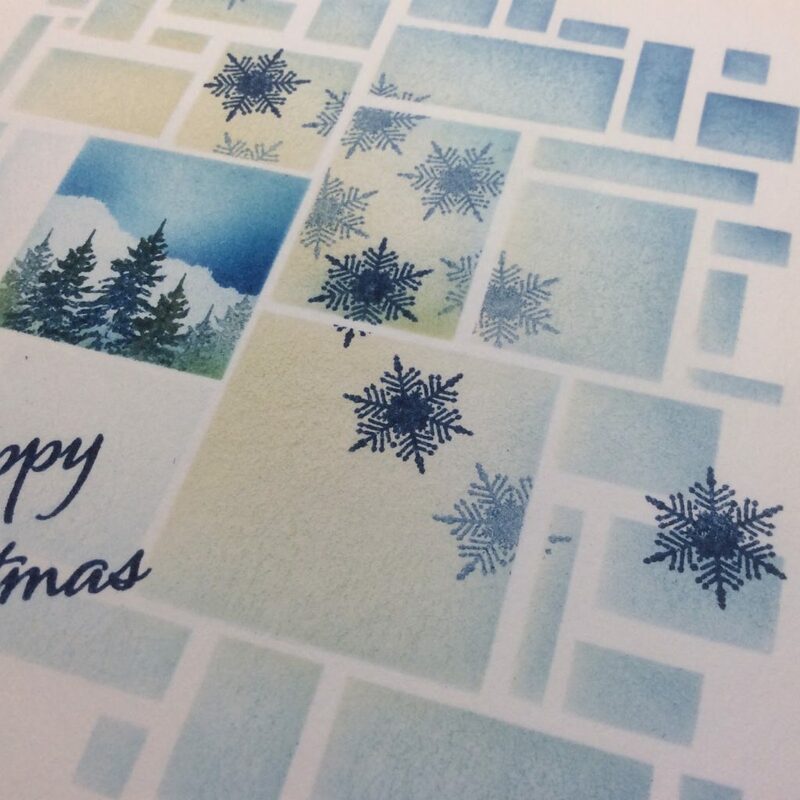 Now set to work with Post-Its, masking off windows and stamping the little snowflake from the set through the apertures. First and second generation Denim ink). 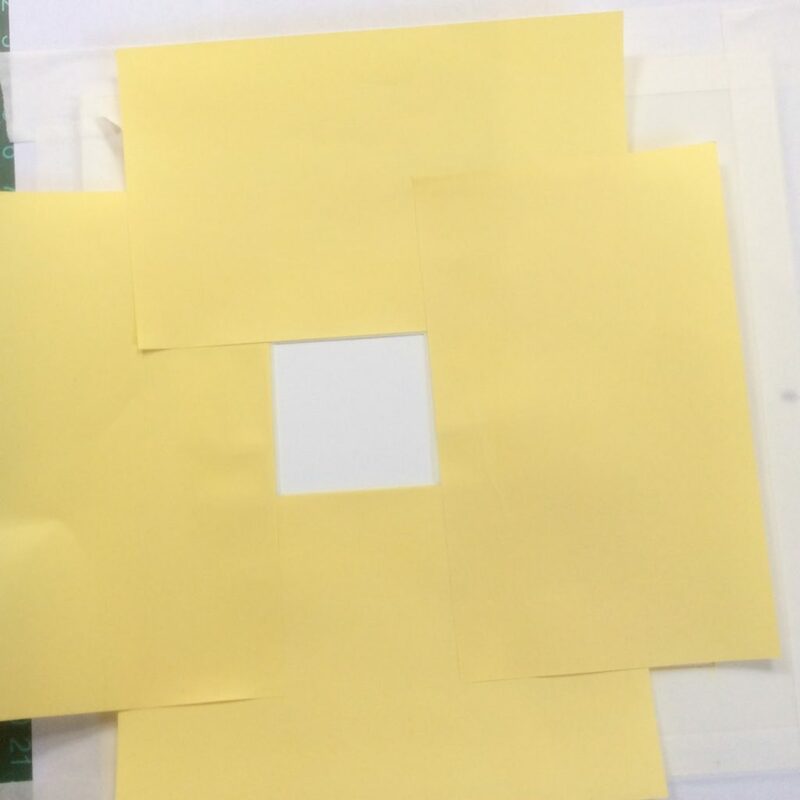 You can see through the Post-its if you want to add the illusion of splitting an image between two windows; just remember to factor in the stencil bars or lines! Add Happy Christmas from the International Greeting set. Dust around all 4 sides with the latte on the stencil brush. 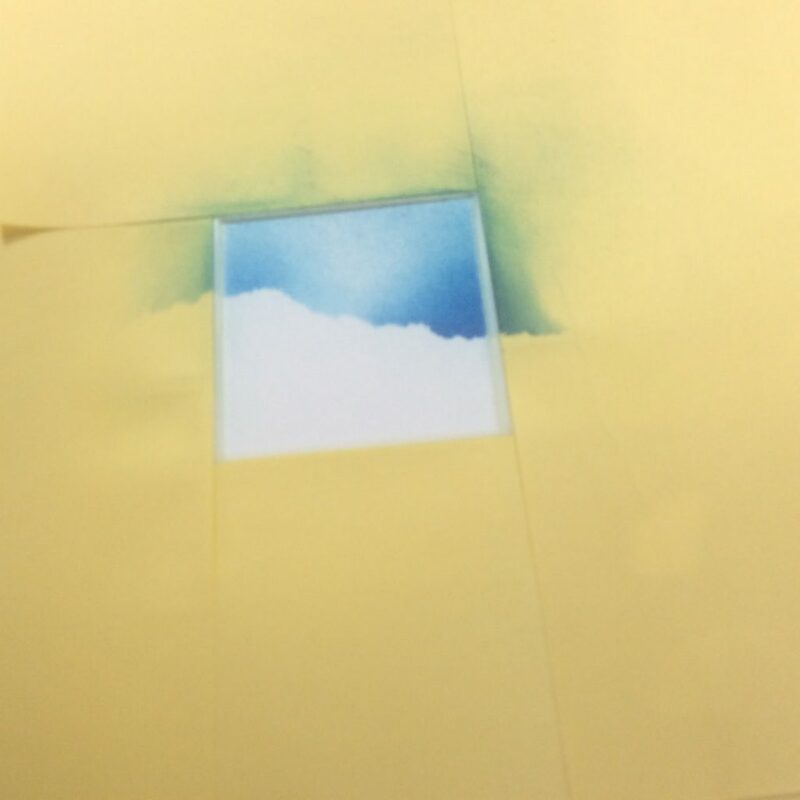 You will find that the water-colour paper yields a very soft, almost velvety result. 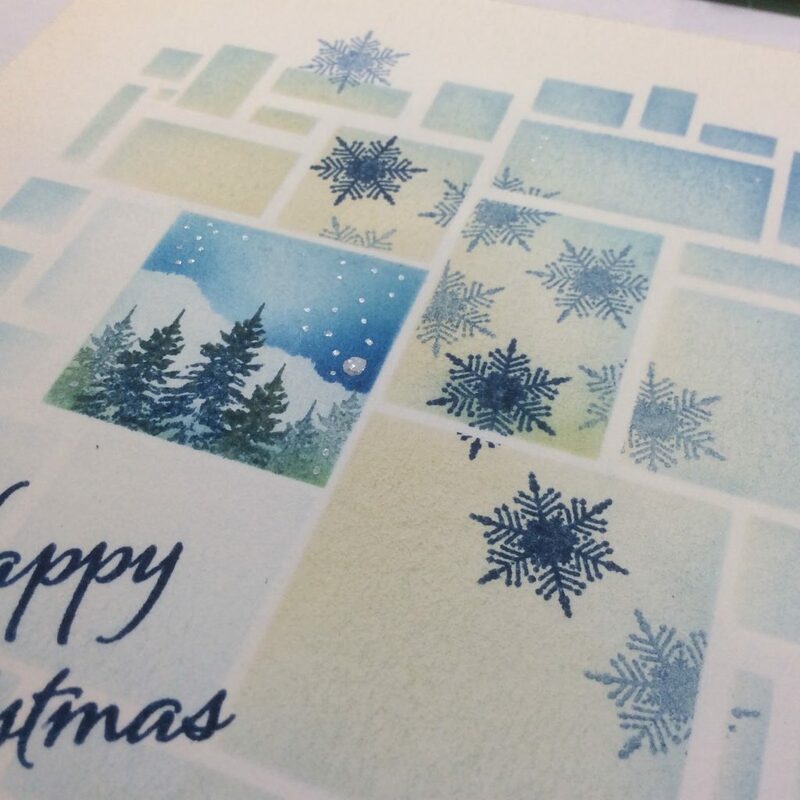 Stamping on Water-colour with dye-based ink (water-soluble) is ideal. 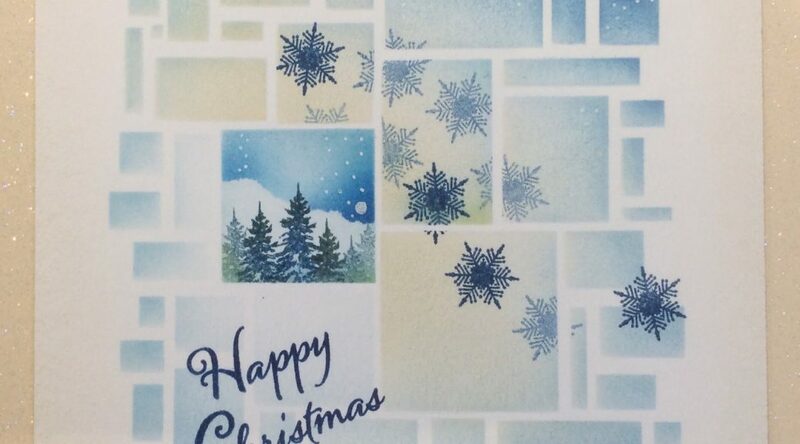 See how you can make it look like the snowflakes are falling down behind the apertures? Or you can bring them to the front! white fineline pen at the ready! it will knock you out!!! Let’s call that one the moon! Mount on a complimentary background. So there we are. 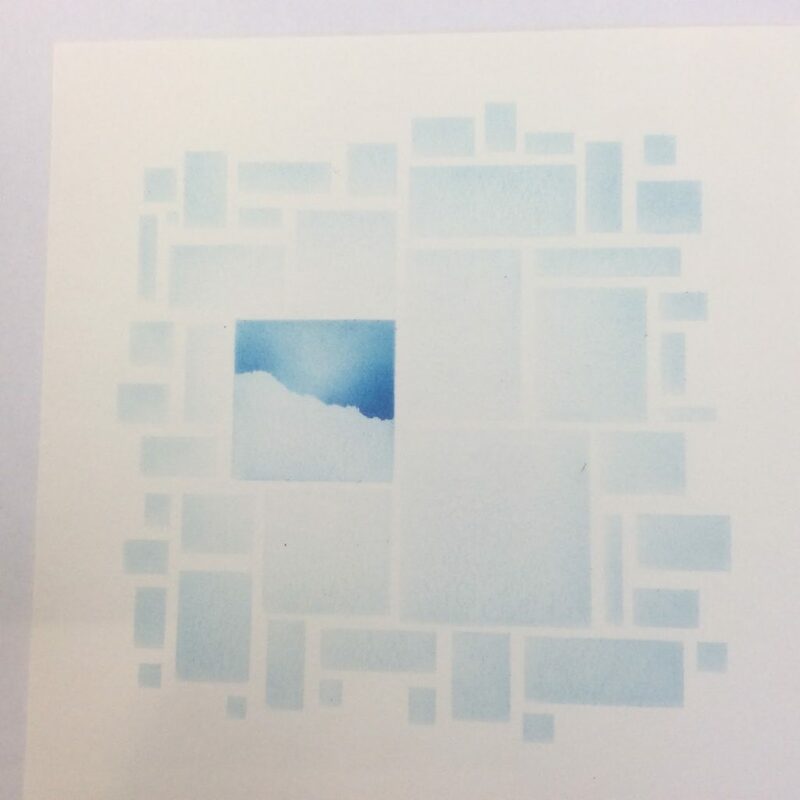 This abstract stencil really is very versatile! 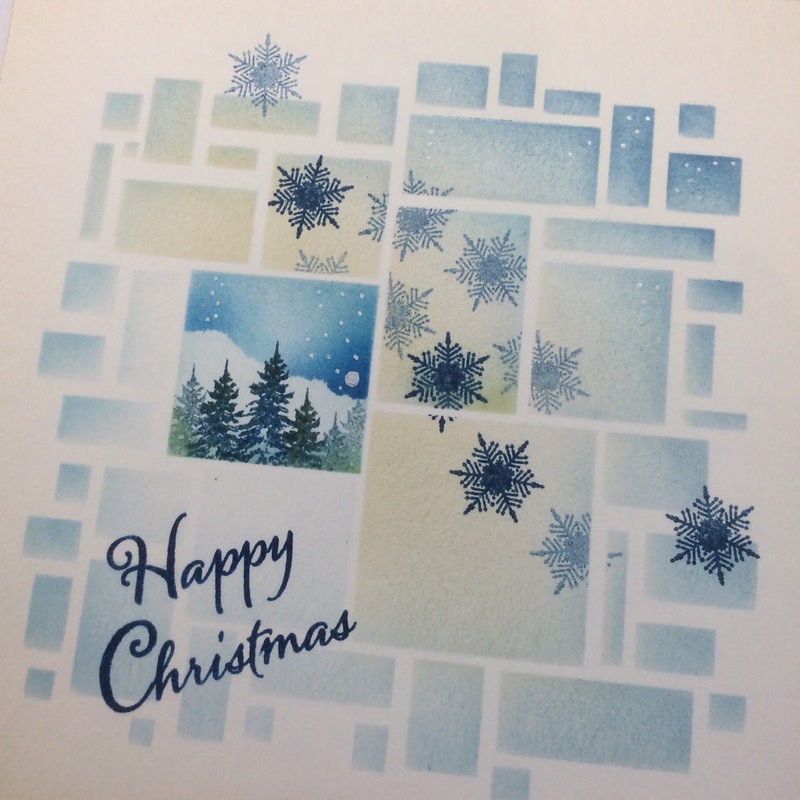 If I had more time, I could make a whole collection of these 50’s retro looking Christmas cards, and create a different centre-stage scene each time, with different miniatures from the little window set. Just a thought…. That is beautiful Barbara! It is so gentle and calm and yet shouts Happy Christmas all the way! I love this Barbara and even at the stage before the snowflakes I thought it was good! When I bought this stencil and miniature set at crowborough this is exactly what I had in mind. How refreshing to see a project where I have all the bits required including the " I can do this" I just need to finish the 6 wooden Christmas stockings I started yesterday. It is very warm outside so working with snow etc will cool me down!! 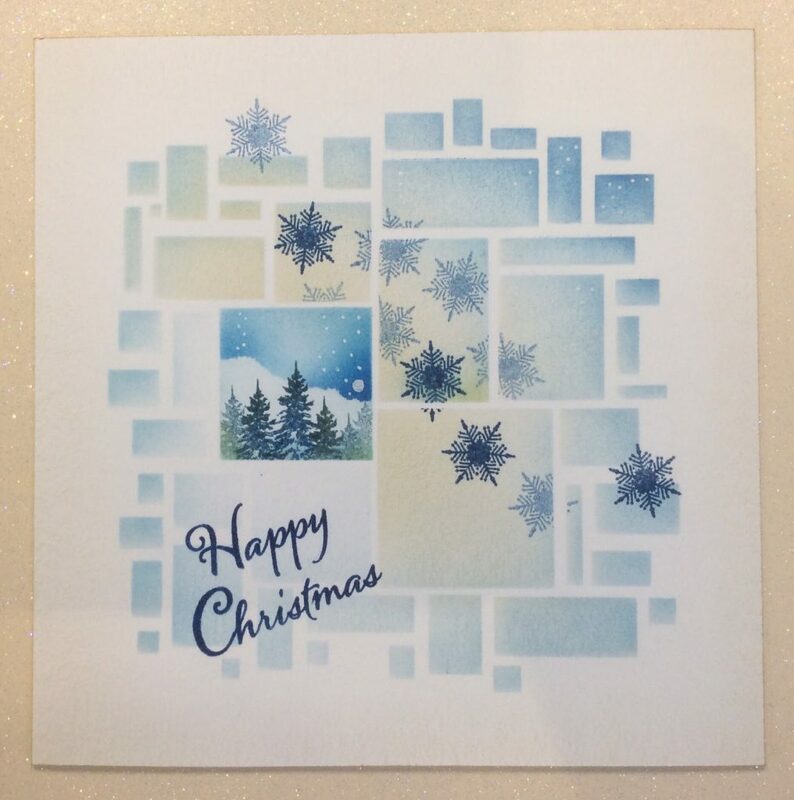 Lovely, just about to start my Christmas cards today so excellent timing! Live this stencil. 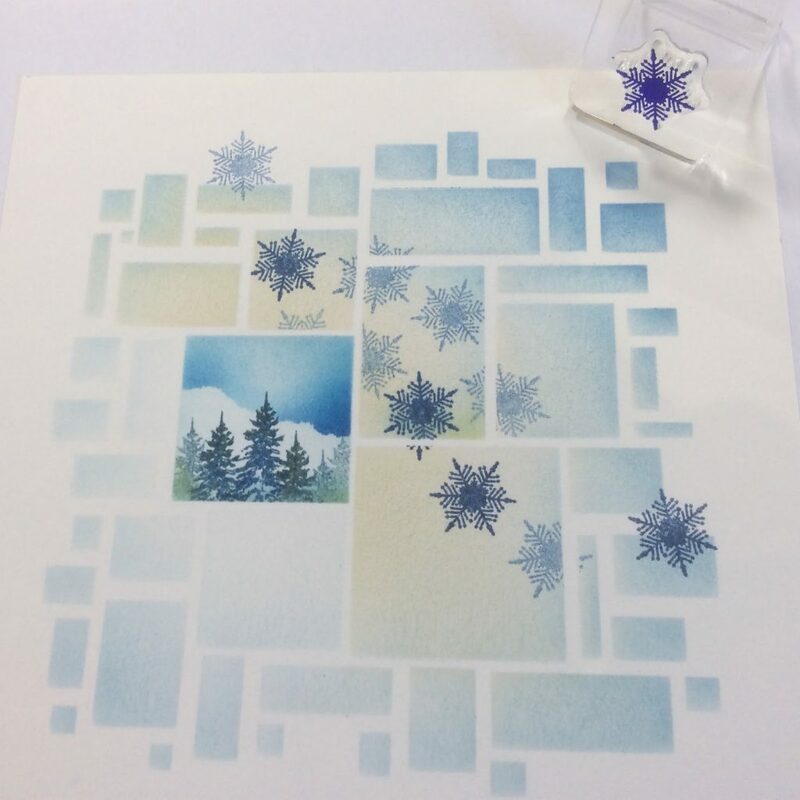 Beautiful, I have this stamp set but haven't gotten round to using it. Good to get some inspiration. Absolutely stunning Barb, love it and how unusual. Good Afternoon Barbara…Wheres the sunshine gone!!! 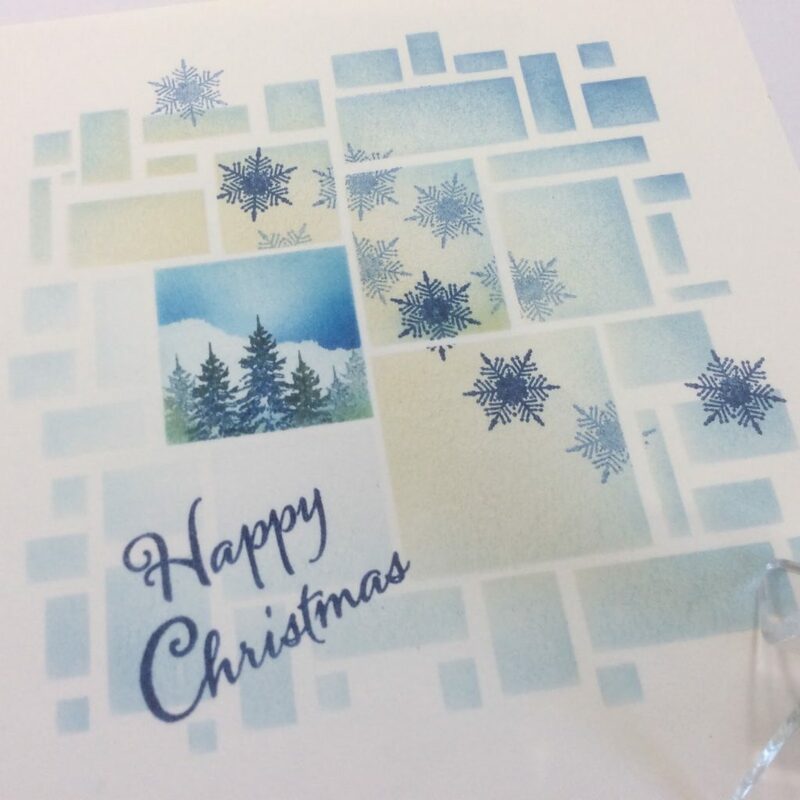 Having spent a wonderful day with Sally-Ann at Clarity East Midlands yesterday – am feeling fired up for crafting and todays blog is lovely – you are right Christmas seems ages away – yet everything in the shops tells you otherwise – so time to start making a few cards and this will be a great one to give a go with!! Stunning card, really Wonder sometimes where you find all your lovely ideas. I could just feel my blood pressure reducing as I watched this lovely image develop and is'nt that what crafting should be all about. 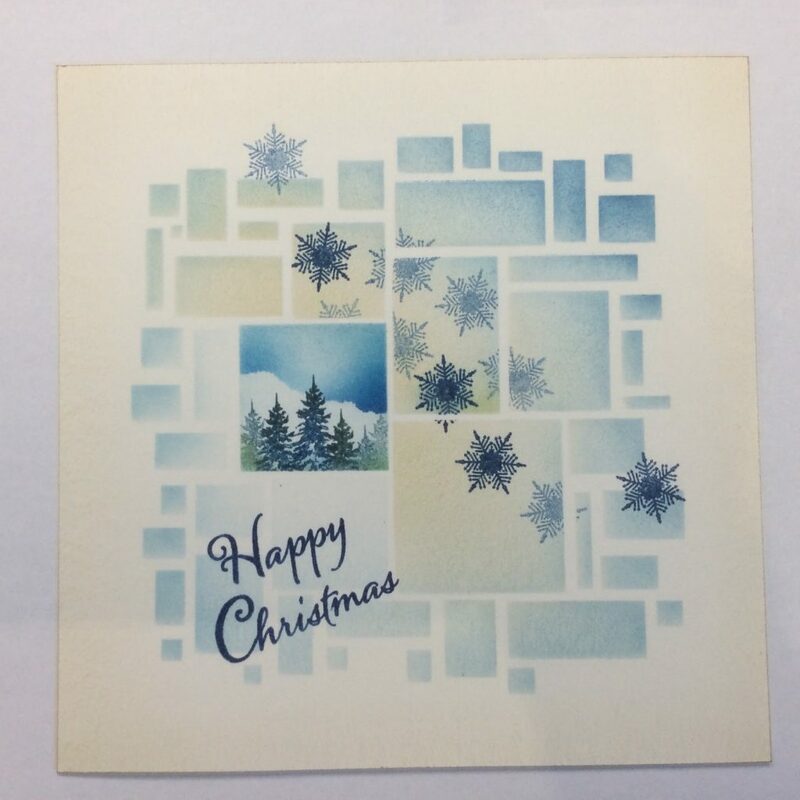 I have this stencil and you've given me something to think about,this is a lovely Christmas card with a soft look to it. Fabulous card and super idea. Absolutely gorgeous. I love it, love it, love it. Love the versatility of this , like you say so many possibilities ! Think that this stencil will be this next pay days craft stash buy. 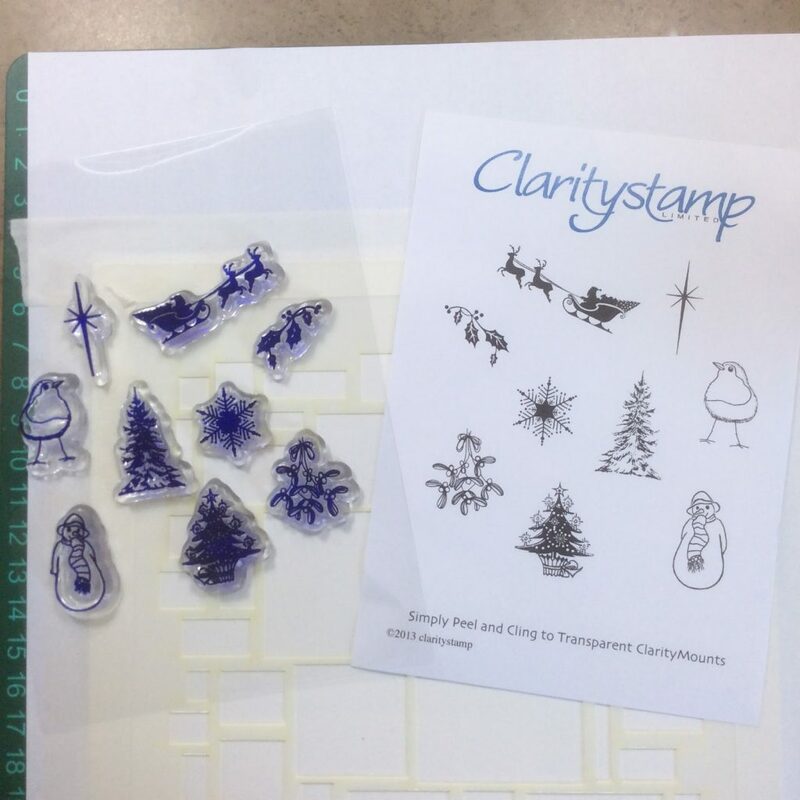 As cash formy stash is so limited I love this stencil as not only fab with this stamp set but will breath new life in to some of my other stamps I own.